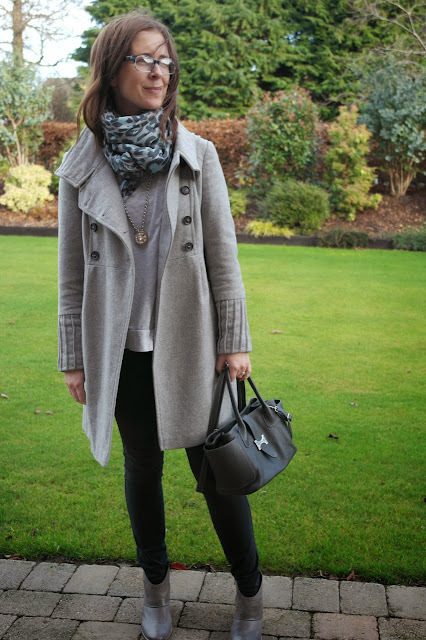 A short post today with lots of grey - it's just such an easy colour to wear and I'm constantly drawn to it when I'm shopping. This is what I wore to the girls' Nativity Play yesterday - I blubbed throughout. Even when children other than mine were performing. I blame the hormones! I hope you're having a good weekend. I'm recovering from a book-club Christmas night out last night and I'm heading shortly to the Gospel Choir's big Christmas concert in Belfast. I'm so looking forward to a restful day tomorrow but I will do a quick post to show you what I wore out last night - it's a great little addition to my wardrobe that I can't wait to share...and it's not grey! PS I remember blubbing at my childrens nativity - I couldn't really blame it on the hormones :0) but it is so wonderful to see your children developing before your eyes ! I've often thought grey looks chic and you've just proven that! I'd love to wear it more but it totally washes me out...people tend to tell me I look tired.